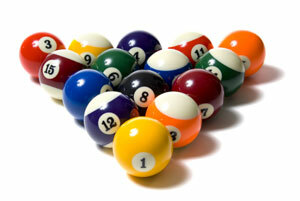 There are a few different variations of shooting pool games, each with their own rules. It’s suggested that every player be familiar with at least the three most common variations: Nine-Ball, Eight-Ball and Cut Throat. We’ll begin by summarizing the common Eight-ball game that most of us know. Many people refer to it as stripes and solids. Beware of your terminology though. If you go out and play with more accomplished players, you will find the correct terms would be high and low, not stripes and solids. The rules will vary depending the skill level. 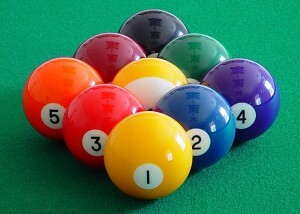 To keep it simple, all balls are racked with the eight ball in the center. Upon breaking, the ball that goes in first will be your ball. Play is rotated when a shot is missed or a foul committed. The main object is to sink all your balls and the eight ball before your opponent. Always remember the eight ball is your last ball to go in! As mentioned, there are many rules people play by, so be sure to specify them before beginning a game and make sure all players are clear and understand them. The next variation is Nine-ball. In this game, the balls used are 1 through 9 and are racked as a diamond in order of number, with the nine ball in the center. The idea is to sink the balls in order from lowest number to highest, starting with the one ball. Any ball that goes in counts as long as the lowest numbered ball on the table is hit first. For example, if the lowest ball on the table is the four ball, you can either sink that ball or use that ball for a combination shot to sink another. If you fail to hit the lowest ball first, it is a foul and the other player will have cue in hand to place. The winner is the player who makes the nine on a legal shot. The third common variation is cut-throat. This is a common three player game. Each player takes five balls, 1-5, 6-10, and 11-15, and the last player with a ball on the table wins. The goal is to sink your opponents’ balls. There are several variations. The penalty for a foul is to bring one of each of the other players’ balls back onto the table. 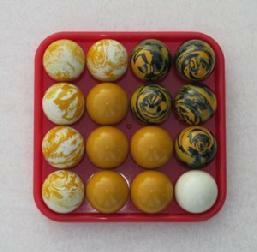 Sometimes this game is played with 3 different colored sets of balls to make it easier to keep track of who has what. There are many shooting pool games, all with their own guidelines and rules. Find the style of your play first, then choose your game. The more you familiarize yourself with the different variations, the better player you will become. What are your favorite shooting pool games?